« Shhh! Google in cahoots with Fuller to change the TV industry? I want to scream. The reason I like downloading TV shows from iTunes or Amazon Unbox is I can watch them later, when I have time. I pay for that privilege, and for no advertising during the show. 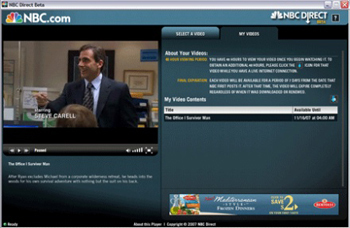 So here comes NBC Direct, the now-in-beta ad-supported service from NBC that lets you download full episodes of the network’s shows to your computer. But guess what? You’ve got 48 hours to view them. In fact, NBC makes the shows available for only seven days after initial airing. That episode of “The Office” I missed two weeks ago when the DVR failed to record — gone, no longer available on NBC Direct. Same for the first few episodes of “30 Rock.” So what’s the point of a video download service that makes you stick to a schedule, just like network TV? But that’s not all that ticks me off about NBC Direct. I’m primarily an Apple guy, but Direct is unfriendly towards Macs. In fact, Direct is unfriendly towards the browser Firefox, too, as it only plays on PCs using Internet Explorer and Windows Media Player. If you live outside the U.S., sorry, NBC Direct is not international. Whew! Glad I got that off my chest. The rest of NBC Direct doesn’t bug me as much, like it does many folks around the Web. While I mostly agree with NewTeeVee, which wrote today “NBC Direct: Don’t Bother”, I didn’t find the pre-roll ads at the start of every program, and the 15-second spots where regular TV commercial breaks would be, that offending. Heck, 15 seconds is a lot better than the three or four minute commercial interruptions I skip using the DVR. Others have described the setup annoying. Mine went smoothly. I downloaded the NBC Direct Installer, which installs a special player for viewing. During the process, a message popped up that said I needed a security update for Windows Media Player. The installer found what I needed, installed it, and continued. Once finished, I had a reasonably easy to use player that gave me two tabs — Select a Video and My Videos. Unfortunately, all that’s available at the moment are episodes from “30 Rock”, “Bionic Woman”, “Friday Night Lights”, “Life”, and “The Office.” I expect this will broaden over time. I chose to watch Michael Scott survive in the Pennsylvania woods on “The Office”, which downloaded in a matter of minutes. I tabbed over to My Videos, where the programs I’ve downloaded are listed along with a notice telling you the show is available until such and such date and time. If you like living by network TV schedules, NBC Direct may be for you. For those of us who time shift, NBC Direct is a huge disappointment. It really amazes me how much the major networks fight what seems like obvious roads forward. Why put a time limit on the materials? I know they want us to buy the DVDs, etc…But I still do buy DVDs, etc. of things I really like. The commercials are way too loud. 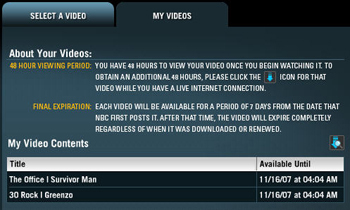 Thanks NBC for bringing over the annoyances of broadcast TV to the internet!